Phlebitis Treatment - The Whiteley Clinic treat the underlying cause. In the past, doctors and nurses used to think that phlebitis (properly called superficial venous thrombophlebitis) of the leg was a simple condition that caused pain and discomfort, but never caused any risk to the patient. Unfortunately this has proven to be wrong. 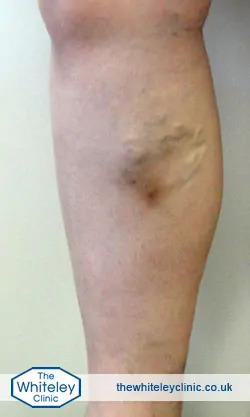 Research and recommendations published between 2010 and 2012 have shown that the clots in the superficial veins that cause phlebitis can extend into the deep veins causing a deep vein thrombosis (DVT) and can also fly off to the venous system causing the potentially very serious pulmonary embolism (PE). Therefore the old treatment of making the diagnosis clinically and without a scan, and then treating with aspirin (or even worse antibiotics), heat or cold compresses and support stockings is now a completely outdated and could potentially allow a serious or even potentially life-threatening condition to develop. As such the American College of Chest Physicians and the British Committee for Standards in Haematology have produced guidelines that help doctors get the very best diagnosis and treatments for their patients. The Whiteley Clinic have developed a protocol to investigate and treat patients with phlebitis or suspected phlebitis based on these guidelines. As soon as phlebitis (superficial venous thrombophlebitis) is suspected or diagnosed, an urgent venous duplex ultrasound scan should be arranged. This scan should be performed by specialists used to looking at veins. Using the results of the scan, the correct treatment can be selected. If an underlying deep vein thrombosis (DVT) is identified, then it is the DVT that needs urgent treatment and anticoagulation (blood thinning medication) will be started immediately unless there is a very serious reason not to do so. If there is no deep vein thrombosis (DVT) but there is extensive clot in the superficial veins that is at risk of causing a deep vein thrombosis, then it is recommended to start anticoagulation (blood thinning medication) to stop the clot extending and forming a deep vein thrombosis (DVT) and possible pulmonary embolism (PE). If there is a reasonable amount of clot, but at less risk of causing a deep vein thrombosis (DVT) then it is recommended that a course of injections of heparin is started for several weeks. Once again this reduces the risk of clot extending. If the scan shows that there is only a small amount of clot causing the phlebitis, then aspirin or other non-steroidal anti-inflammatory drugs can be used to reduce inflammation and pain. Of course if the scan shows there is no clot underlying the phlebitis, then it will show the diagnosis was wrong and the correct treatment can be started for whatever the problem actually turns out to be – often a local infection called cellulitis. In virtually all cases, graduated pressure stockings will also be used both to give the patient comfort and support as well as to further reduce the risk of extension of the clot in the veins and therefore reducing the risk of worsening phlebitis, deep vein thrombosis (DVT) and pulmonary embolism (PE). We know that almost all phlebitis in the legs is due to varicose veins or hidden varicose veins. We also know that varicose veins and hidden varicose veins are caused by venous incompetence and venous reflux. Thus treatment of the venous incompetence will stop the venous reflux and therefore treat the varicose veins or hidden varicose veins. This will prevent any further phlebitis. As with all varicose vein and hidden varicose vein treatments, these are now best performed by investigating which veins require treatment with a specialised venous duplex ultrasound performed by a specialist vein unit. This test will allow vein experts to select the appropriate endovenous treatment to get rid of the veins for good. This will usually be one of the thermoablation methods such as EVLA or “EVLT” (endovenous laser ablation or endovenous laser treatment), RFA (radiofrequency ablation), or one of the other methods such as TRLOP (transluminal occlusion of perforators), glue or mechanicochemical ablation (MOCA). These thermoablation methods may need to be backed up with other more specialist treatments such as coil embolisation of pelvic veins, ultrasound guided foam sclerotherapy or phlebectomies – which are rarely sufficient treatments by themselves. Treatment of the underlying varicose veins using the methods outlined in The Whiteley Protocol® will give both the lowest possible chance of getting phlebitis back again in the future as well is getting the lowest possible chance of developing recurrent varicose veins.